We went on a trolley tour of the city for most of the morning. If you’ve never been or don’t know much about the city, GO ON THIS TOUR. I learned so much, and even Noah (who’s been to Key West before) learned some too. I’ll just let the pictures tell you about the day! 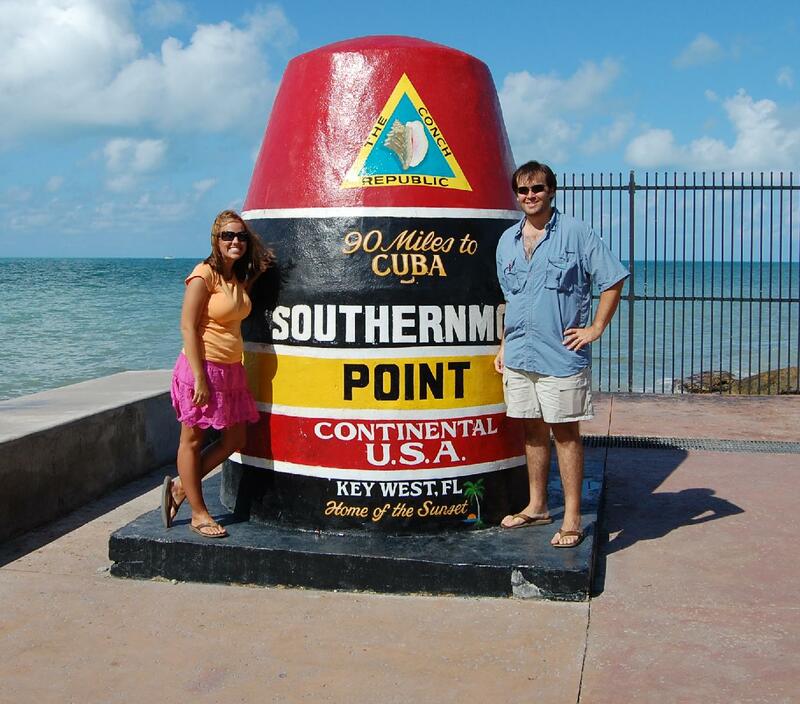 When we first got there, it was raining (which is apparently very rare in Key West). The sun was still shining though, so it was actually pretty! I probably should have deleted this picture, but I thought it was funny. My camera strap broke and my brand new, very nice camera hit the wet, concrete ground like a rock. I just about had a heart attack, and Noah was taking this picture to make sure it still worked. So this is my “please God let this picture take” face! Where Jimmy Buffet got his start – we love him! There are TONS of roosters everywhere in Key West – something to do with letting them go after cockfighting became illegal. They are really pretty actually! After the tour, we went to the Guy Harvey restaurant. We have had it in Gulf Shores before, and it was just as good here as it was there! Then we sat on the back deck of the ship while it was storming. It was SO relaxing. Back in real world news, little guy isn’t feeling too well today. Can’t you tell he doesn’t feel good, or is it just me being crazy momma? He threw up a couple of times this morning, and he has been sleeping non-stop since we got back. We thought it was just because he was so worn out from playing at Superman and Wonderwoman’s house all week, but I’m starting to think he’s actually sick. Back to work on some new blogs…I’ll post them when I’m finished! I have always wanted to go to Key West too!! It looks like you guys had so much fun!! Glad your camera is working! !